Standard - $73.99 X-Large - $73.99 Only 5 left! If you’re going to be a hero, you might as well do it with some style! Luke Skywalker? He’s got no style. He wears a pair of pajamas for most of the original Star Wars Trilogy. He has no swagger. Obi-Wan had that killer beard, so he had a little bit of swagger. Han Solo did it better. At least he had a cool ship and a Wookiee for a best friend. But the king, nay, the sultan of swagger is none other than Lando Calrissian, the smooth operator from Socorro. He’s a gambler, a hustler, and a hero. Now, if you plan on being a hero, then you want to be the hero with the most swagger! That means that you definitely want to be Lando Calrissian. The good news for you is that it’s easier than ever with this Solo Lando Calrissian costume. 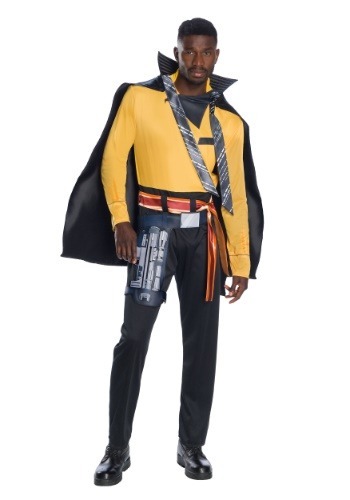 This officially licensed costume comes from Solo: A Star Wars Story. It comes with a flashy jumpsuit that has a yellow top with printed details on the front. The bottom portion is designed to look like a pair of fancy black pants. The waist sash has a bright myriad of colors and ties neatly around the waist. The included cape is a satin fabric and attaches to the shoulder. Finally, the foam belt with attached holster makes you look ready for any sort of heist mission you might end up going on! Now, you might want to brush up on your gambling skills, because when you wear this Lando costume, you can bet on Han Solo trying to hustle you out of the Millennium Falcon. You can even check out our Han and Chewbacca costumes to create a group costume that’s ready for the biggest heist this galaxy has ever seen!